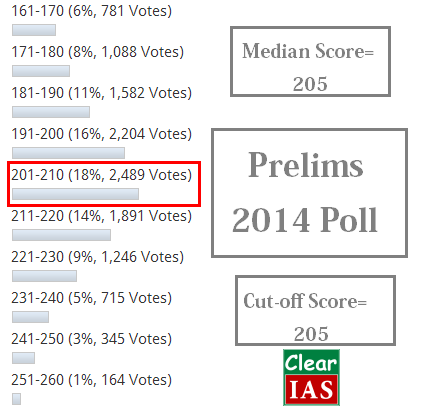 Clear IAS™ used to conduct all-India polls to get an idea about the expected cut-off marks for UPSC Preliminary exam. Last year, more than 12,000 candidates submitted their exam feedback and their median score (205) turned out to be the exact cut-off score for Prelims 2014. This year, we have upgraded our polls by integrating it with our test engine to automatically generate graphical data of test-takers to give relative all-India position and approximate cut off marks for UPSC Civil Services Prelims 2015. Aspirants need to register and login to mark the answers in the test-link. You can submit your answers online and our system will automatically calculate your scores! The facility is free and it hardly takes 10 minutes to get your prelims score! After this, you need to check the rank-list page for 2015 CSE Prelims based on Clear IAS answer key to know relative all-India position and approximate cut off marks for UPSC Civil Services Prelims 2015. Last year, pre-registration was not mandatory to enter their scores and score calculation was manual. Still because of large participation the survey results matched the actual cut-off. This year, we have upgraded our polls by integrating it with our test engine to automatically generate graphical data of test-takers. Only one attempt is allowed per username. The more aspirants enter their scores (bigger sample size), the more accurate will be the cut-off score. Our new test engine adds better reliability of the data due to the registration component involved. Automatic calculation of scores will reduce manual errors too. Automatically generated rank list gets updated every time a new user takes the test. Our graphs will give a clear picture about the exam difficulty and relative performance of candidates who took Prelims 2015. 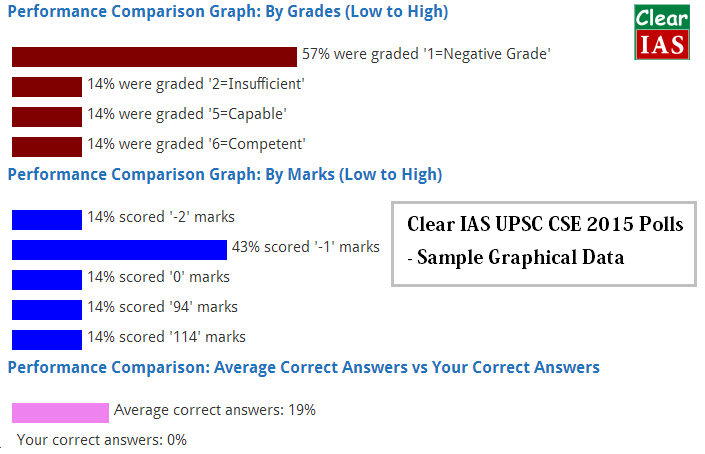 On a closer analysis of percentage of candidates per each mark and the median mark, you will get an idea about the approximate cut off marks of UPSC 2015 prelims, which will have more chance of being correct than from any other source. Disclaimer: Remember that official UPSC cut-off marks for Preliminary exam varies each year. The cut off depends on many factors like the number of students appeared, their performance and number of vacancies. As one of the most reputed unofficial answer keys, we have taken time to prepare the key this year too, but still there can be 3-5% difference with the official UPSC key. We will update our answer key when the official key is published, but normally it takes an year to come. Also note that it may not be possible to extrapolate the exact cut-offs marks for Civil Services Prelims 2015 due to low sample size of the internet population. cutoff for csp15 will be 85 for gen,80 for obc and 70 for sc….see and prepare mains. I m Anita nd belongs to sc category.Y score is 95. Wat r my chances to crack dis xam?? my core is 110 and is the is chance for csm 2015 ? I AM SHYAMALA AND I BELONGS TO OBC CATE .MY SCORE 96. WHAT WILL BE CHANCE FOR MAINS???? PLS REPLY ME SIR. i am lokesh belongs to ST category. My Score is 86 marks. what r my chances for mains exam? mera score 85 tak ja raha hain main main ki tayari karu ???????????? what wil be the cut off for general categary? Sir i am Rafia…i have scored 71.9 marks..Obc…what about my chances for appearing in mains sir..many people are asking me to prepare for mains and i m also preparing..but some,people are demotivating alot..really in confused state…this is my first attempt..dear sis/Bro will i clear the prelims. Cutt off kya upsc ke cutt off aane ke bad doge kya??????? Keval sample hi collect kar rhe ho..
@rafia how you to come to know your marks for UPSC IAS Civil Services (Prelims) please help meprovide any link please.